Neat country cottage is well-maintained and ready to move into! 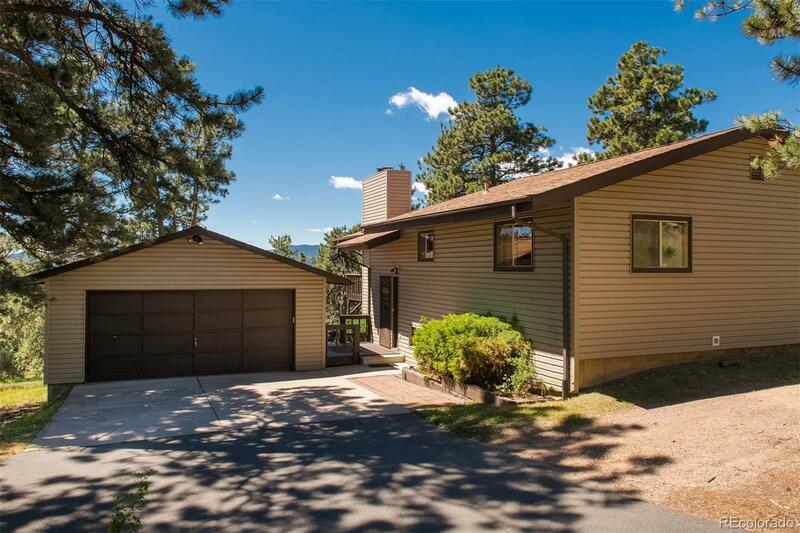 Conveniently located with easy access to both I-70 and Highway 285, this home sits on 5+ sun-filled gentle acres 10 minutes from downtown Evergreen. Zoning allows for animals and the well is approved for domestic usage. With ultimate privacy and quiet, the beautiful land offers mountain views of Double Header plus a variety of mature pines. Vaulted living room has a wood-burning brick surround fireplace and sliding door to wide view deck. Kitchen features a Kenmore 5-burner electric range & dishwasher, GE microwave and Whirlpool refrigerator. Master bedroom has its own 3/4 bath, while a 2nd main level bedroom is across from the full bath with neutral finishes. Walk-out level has 2 bedrooms, 3/4 bath, family room with sliding door access to a good-sized patio, supplemental propane heater plus roomy storage with space for a workshop. Newer carpet, septic tank, 8 year old roof + washer/dryer & freezer are included.